Have you ever left a website frustrated, not being able to find the needed information about the company? Have you ever uninstalled an app, a potentially useful app, that later turned out to be a real pain to use? Sadly, you’re not the only one to encounter this problem. The internet is flooded with examples of poor user experience. Then you decide to build your own product. And, as we both know, you are not like most of the product owners out there: You really care about your customers and want to provide an outstanding user experience. But how do you do that? Reading a couple of articles on UX Magazine or UX Design Weekly won’t make you a UX designer. Furthermore, designers and developers do not necessarily have what it takes to create an outstanding user experience. The best way to go about this task is to go with a proper UX design process. Joel Marsh, a well-known O’Reilly author and professional designer, in his book “UX for Beginners” states: “UX is a lot more than buttons and wireframes. The stuff that seems obvious is only the tip of the iceberg, and the stuff that matters most is completely invisible.” In fact, design is only one of the 5 main ingredients of UX: psychology, usability, design, copywriting, analysis. Day 1: Unpack – define the problem and choose the primary focus area for the sprint. Day 2: Sketch – outline a solution. Day 3: Decide – choose the idea(s) that you will take to the next phase and create a hypothesis. Day 4: Prototype – make a prototype. Day 5: Test – let the real users (usually 6-20 people) get involved and test the prototype. We at AltexSoft have adopted a similar approach, which is fully customized based on the specifics of your project. 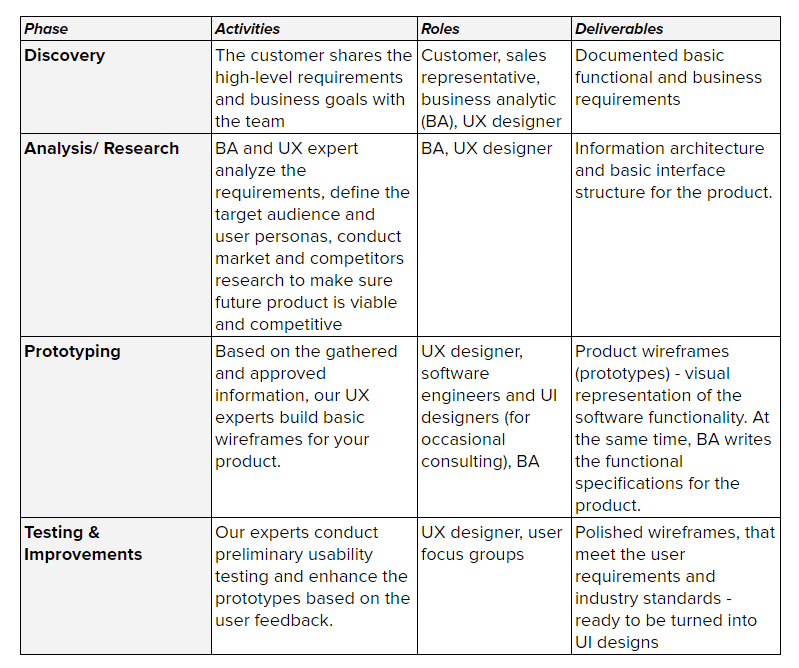 A typical UX product development process contains the following stages. Remote Usability Testing (Unmoderated) – The process is usually conducted using specific tools, such as UserTesting.com, Userlytics or UserBob, which allow you to publish your prototype and have actual people review and test it remotely for a small fee. Moderated Testing – It is similar to the previous one, but conducted “manually”. This option is somewhat costly and requires an actual interviewer conduct the testing and special eye-tracking and recording equipment to document the process and results. Expert Review – As follows from the title, this type of usability testing relies on an independent expert opinion. This could be specialized agencies or proven industry leaders, rather than ordinary users. According to the Nielsen Norman Group, up to 80 percent of usability issues are usually detected by only 5 test users. At the prototyping stage, there is no need for large focus groups and significant investments into the process. However, this early testing proves extremely valuable in the long run. Being able to detect and fix the possible issues early, saves time and efforts. Making a simple change in a wireframe takes about an hour. The same change in the UI design might take up to one day. And it might take even more time and efforts to implement this change after launch. As we mostly follow the agile approach in software product development, the above-described iterative process is usually recurring. Iteration by iteration, we discover, analyze, prototype, test and implement new functionality, one feature at a time. Therefore, the process is never complete. The importance of a proper UX design process is undisputed. However, even after the product is launched, there is still a room for improvement. The technology is evolving fast, so are the user expectations. In order to stay competitive and profitable, you need to keep up with these challenges. A great, and cost-effective, way to improve your product after its launch is to invest in professional UX consulting. At this stage, professional UX consultants gather users’ feedback, measure KPIs, and provide actionable insights and recommendations as to how you can improve your product interface and its conversion. The process is usually tailored to fit your business objectives and requires special skills and tools. According to the Customer Experience Optimization Report by eConsultancy.com, 94 percent of respondents have seen higher conversion rates as a result of their commitment to customer experience. The famous case of a “$300 Million Button” is a great example of how simple UX improvements can make a huge difference in business. By simply removing the obstacles in the checkout process (making the registration optional), the company was able to grow conversion by 45 percent. This resulted in additional $15 million revenue within a month and total $300 million of annual revenue. In his bestselling book “Software Engineering: A Practitioner’s Approach”, Robert Pressman describes a situation when a proper UX process can help you save money in the long run. He states, that if an issue costs $1 to be solved at the design stage, it would cost $10 to be solved during the development and $100 – after the product’s release. A research shows that at least 50 percent of the development time and effort are spent on changes and fixes that are avoidable. For a team of four charging $50 per hour, that makes $4000 in waste every week and over $200,000 annually. The numbers don’t lie: The study finds that 23 percent of users uninstall an app after only one use. Furthermore, an impressive 62 percent will use it less than 11 times. While UX might not be the only problem that pushes your users away, it is one of the things you can and should fix. Regardless of the product or a service you are offering, your solution has to be easy and pleasant to use in order to make the users stay. Be it an eCommerce website or a productivity app – if it is frustrating or does not perform well, most of the users will abandon it and pick another one, with better user experience. With an average online purchase value of $75.9, losing 100 potential buyers might cost you $7,590 in revenue. This is especially true for enterprise products and corporate applications. Simple and easy to use tools require less training, minimize the risk of error, and improve the efficiency of your business operations. Improving the operational efficiency of a team of 10 by 10 percent could bring up to 40 additional hours and $1,000 in savings per week (with an average hourly rate of $25 per employee). In case of McAfee Inc., the company was able to cut the support effort (and the corresponding cost) by 90 percent, simply by providing a clear and user-oriented design. Supposing that a support call costs $10 to process, reducing the number of such calls from 100 to 10 means up to $900 in savings. Scott Jenson, a UX professional with 30+ years of experience working at Apple, Symbian, and Google, wrote: “A good UX isn’t hard, it’s just not prioritized”. Indeed, many executives prefer focusing on the immediate value instead of laying a foundation for the future success. Despite its proven ROI, setting up an efficient UX process requires substantial investment. Do you have a senior design leader with real authority? Are you continuously reviewing your metrics? Are designers working with the right people in the organization? Do you really understand what motivates your customers? How can you speed up your processes? While the user expectations and needs are constantly growing, setting the bar high for new products, having a good UX strategy is an important aspect of the business. User-centric companies, such as Apple, Coca-Cola, IBM, Intuit, Nike, Starbucks, Target, and Walt Disney, are setting the pace in almost every industry. That said, proper UX design has a major impact on the business ROI and plays a significant role in the software product development process in general, contributing to the creation of a more consistent, relevant and overall higher quality software product. GV Design Sprints call for testing prototypes on 5 people not the 6-20 quoted here. Can’t believe you’d read such an interesting article written with care, intelligence and time and all you have to comment about is a flaw in the statements. It’s insensitive and ignorant. By the way, there’s no hard rule to usability testing or any of the processes be it recommended by NN/g or a pro with 100 years experience. Product teams are different and dynamic so are the products they create, so are the user motivations for each product.